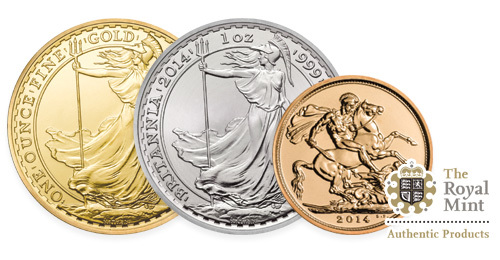 The Royal Mint have this week advised of a mid-November release date for 2014 Gold and Silver Britannia and Gold Sovereign Products. Royal Mint 2014 Gold Sovereign – Retaining the traditional George and Dragon scene to the reverse and Queen Elizabeth II bust to the obverse, the 2014 Gold Sovereign will feature 7.98 grams of 22 carat gold captured within a coin measuring 22mm in diameter. Royal Mint 2014 Gold Britannia – Since production started in 1987, the annual mint of the British 1oz bullion standard coin has carried the iconic Britannia image to the reverse and Queen Elizabeth II bust to the obverse. The 2014 Gold Britannia continues the new 24 carat format of the 2013 coin, providing the owner with a full troy ounce of 99.99% (four nines) fine gold bullion contained within a 38.6mm diameter format coin. Royal Mint 2014 Silver Britannia – Similar in appearance to the gold Britannia coin, the visually stunning 2014 Silver Britannia Coin features a full troy ounce of 99.9% fine silver bullion in a large 38mm diameter coin. Please note, pre ordered 2014 Royal Mint products will be dispatched as soon as stock arrives to use from the mint, current estimates are for a mid-November 2014 schedule. Don’t forget, Royal Mint Britannia and Sovereign coins are regarded as legal tender in the UK and as such, carry Capital Gains Tax Free (CGT) status, ensuring you’ll pay no tax on any realised profits when you come to sell your investment. You can find out more about the rules and regulations regarding Capital Gains Tax on the HMRC web site.